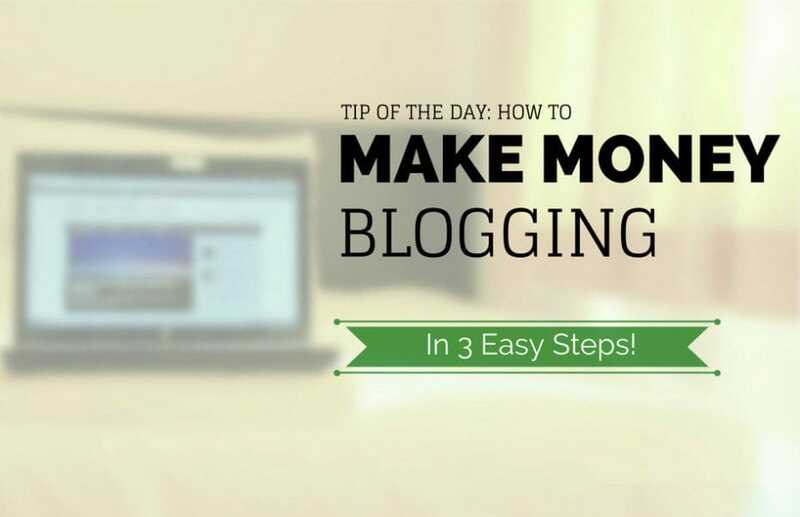 BLOG How To Make Money With A Blog: 3 Easy Strategies That Really Work! How To Make Money With A Blog: 3 Easy Strategies That Really Work! DO YOU WANT TO MAKE MONEY WITH YOUR TRAVEL BLOG OR WEBSITE -WHILE TRAVELING – (EVEN SOONER THAN YOU THINK)? If you are reading this article it is probably because you have a travel blog or a website and you want to know how to monetize it, right? Or perhaps you are already making money with your blog, but it’s not enough to pay the bills and you are wondering how to improve and take your blog income to the next level. If this is the case, you are in the right place, and for once, I want to start with the good news. Even if your blog doesn’t have a massive amount of visitors yet, you can still take it to the next level and make some serious money in a totally legit way.Or maybe you already have the traffic, but you don’t know how to convert it into a side income? This article can help you too, so read on! First thing’s first: before you trust me enough to read what I have to say, I think it’s fair to tell you why I am entitled to write about how to monetize a travel blog. I’ll be honest here. I’m a very lucky girl. Only 3 months after I started monetizing my blog I’m already earning as much as an average 9 to 5 job. And I’m here to help you achieve similar results.When I started my website I had no idea on how to make money with a blog. It was totally unprofessional and I started working on it seriously only 10 months ago. Because of this slow start (and the fact that English is not my native language) I still have a lot of work to do but despite this, I’m already in a good shape, money-wise. So if I managed to succeed, you can too! Below is a screenshot of my stats since I started blogging. It clearly shows you how taking your blog seriously and working hard will give you tangible results in terms of traffic (and money). After some major issues with my previous provider (an Italian company called Webhosting), I researched for months to see which provider was the most reliable. 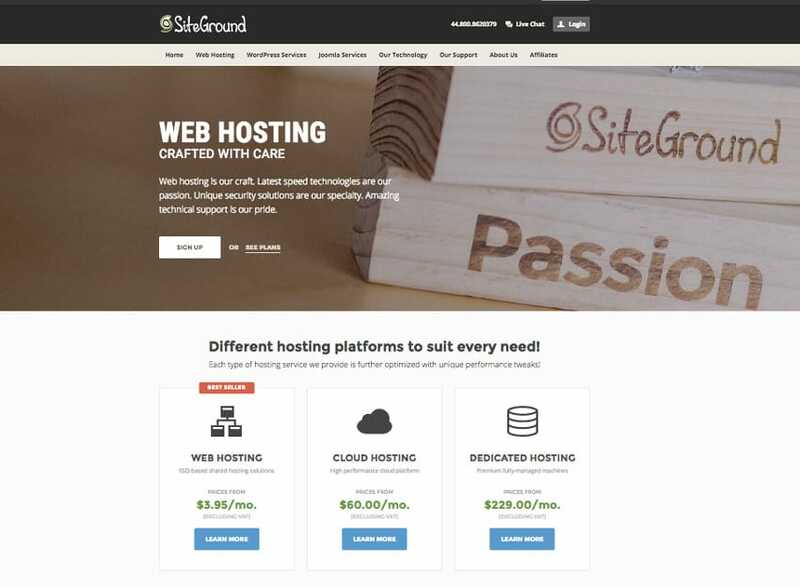 I decided to go with Siteground and I’m still with them because since I made the switch, I saw a spike in traffic and an overall more reliable website performance. I’m just annoyed that I didn’t choose them from the beginning. It took me one year to find it and when I did: Love at first sight! Another small investment, but well worth the money! My theme is called X Theme. After I made the switch, I had so many people asking me about it, so if you want to see the features you can have a look it here. I can tell you that it took me almost ONE YEAR to choose it. Yep, that long. I wanted to be 100% sure that once I got this one, that would be it. And in fact ..it is! This theme is so versatile that I could still be using it and have a completely different layout. 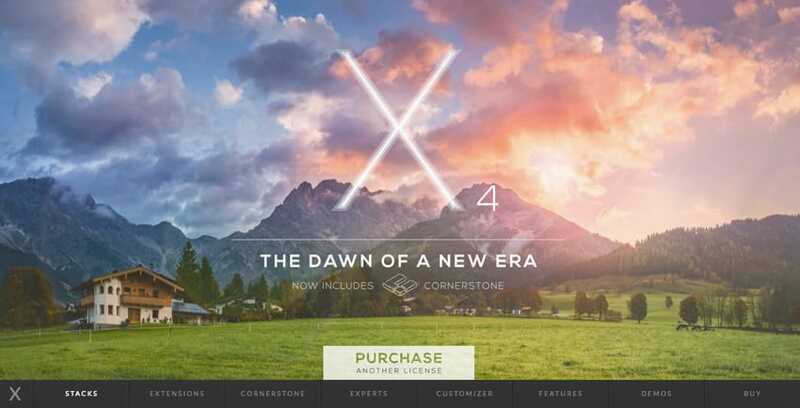 Actually, I have a fresh example to show you how 2 websites can look very different using X theme. I recently created from scratch a secondary website about Sardinia click on the link and check for yourself: do they look similar to you? And the Theme is exactly the same. I LOVE THIS! I won’t go into many details in here, but having a professional theme makes a HUGE difference and I saw it right away! How a few small changes made a massive difference! Monetization progresses: Before and after I switched to Siteground and X theme. What a difference! How can I start a website or blog from scratch? What are the best ways to monetize a blog/website? How long does it take to make money with my blog/website? Did I just wake up one morning and see the money rolling in? I wish It was that easy, but you already know that create a good website and make money out of it is a hell of a job. It takes time, patience and hard work. Do what you really love. Do it with passion. Never give up. In this post, I will focus on the top 3 strategies I used to monetize my travel blog to give you some tips and speed up your earning process. Affiliate programs are a good option for many travel bloggers. The opinions on this model vary from ultimate hate to absolute love. In my case, it was love at first sight. Besides CJ (in the picture) I have some other affiliate programs that give me even better results: Booking.com and Affiliate Windows. I’m also experimenting with Amazon on my article about what to pack for your trip and now with two specific pages on Travel & Photo gear and Travel beauty Products pages, getting decent results. But before you run to your blog and start putting random links to affiliates everywhere, I want to share my experience with you and show you how to make it work. In a nutshell, I search for products/services that my readers might find useful (but most importantly that I have tested myself and find reliable) and put laser-targeted deep links into my articles. 1| The articles rank very high on search engines. They are among the top 3 results on Google for a few profitable keywords. The competition for my keywords is medium-low and I also rank high with “long – tail keywords”. 2| The articles give an added value to my readers. They have a “personal touch”, show my expertise and give the readers precise answers to their needs. This leads to interaction(more comments) and conversions. 3| My affiliates have high conversion rates and/or good commissions. 4| The topic is in a profitable niche and it’s targeted to a specific segment of my audience. That said, the results with affiliates don’t come overnight and are not applicable to all the posts. WHAT IS THE APPROACH YOU SHOULD TAKE WITH YOUR AFFILIATE PROGRAMS? You have to make it to the top by implementing internal and external SEO strategies, which takes up to 3-4 months. For blogs with higher PR and Domain Authority, it usually takes less to rank higher on Google (if you do your homework properly). Very Important: people don’t realize how important is to have a good hosting provider. Try at least 5-6 affiliate programs to see which ones work better with your audience. A trial and error phase can take up to 1-2 months. Continue to give added value by replying to the comments in detail. Time-consuming, but worth the investment. Your readers will see this as a proof of authority and trust, which leads to high conversion rates. I was able to make more than $250 in commission just by replying to a comment a few times. How? I linked to my affiliates in the comments as well. Not bad, huh? Don’t obsess too much over Page Rank and Domain Authority. When my most profitable article made it to the first page, my blog was not even 1 year old and had PR 0. Write good quality content and in time, it will pay off in your Google rankings. Obviously having quality backlinks is still important, but in my case, they were not the main reason behind why I am making money today. Maybe with the hope that someone will click on them. It doesn’t work well and is counterproductive as the reader is not stupid and will find it annoying. Always place relevant, useful deep links. Banners don’t convert as well as links. when you see that an affiliate is not performing after a month or two, simply remove the links. They are just eating up space and distracting from your best-performing programs. Don’t put an affiliate simply because other bloggers are making money with it. Your blog and your audience might be different and it might not perform in the same way. 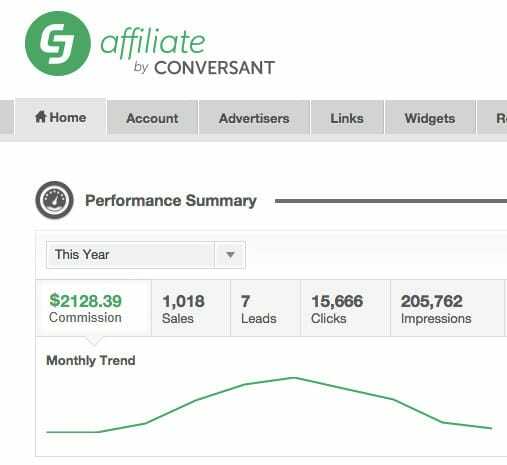 You are already using affiliates, but you’re not seeing much monetary return? Have a deeper look at your best articles and keep trying new affiliates. It took me a while to make it work, but when I finally found the right ones, they became a steady source of income. Sponsored posts are one of the most popular ways to earn good money with your travel blog. This monetizing model is somehow controversial. For Visibility: The advertisers pay an influential blogger to have more visibility and, consequentially, to increase their earnings and reinforce their brand image. For SEO: The advertisers who pay you to place a link or an article written by them for SEO purposes. They usually target websites with high PR and Domain Authority and request a “Do follow” link. Even when I had PR 0, I received a few business proposals, and I turned them down because buying and selling links goes against Google’s policy. Like it or not, that’s the way it is and I don’t want to risk months of hard work for a few bucks now. I also think that this tactic is not smart for the advertisers. In my experience, PR doesn’t play a huge role on SERP (search engine results page) anymore. HOW CAN YOU FIND LEGITIMATE SPONSORED OPPORTUNITIES? Sometimes sponsors will find you and contact you directly some will just want exposure on social media, whilst others want to publish content on your website. The downside here is that you need to wait for the sponsors to find you, or pitch them and hope to get a positive response. They are great places to connect influencers (bloggers) with sponsors in a quick, easy way. Unfortunately, many of these websites still accept advertisers looking for “Do follow” links, with the risk of getting penalized by Google. A very good website I’m currently using, that is totally legitimate and professional is “Themidgame“ (you can see the main page for the sign up on the picture above. Click on it if you want to know more). 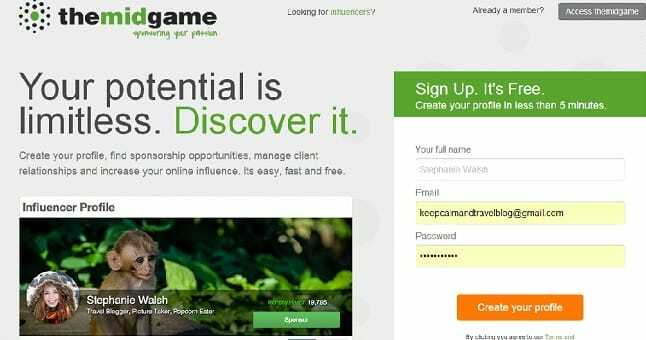 It works like this: You, the “influencer”, sign up for free and connect your stats from Google Analytics and social media accounts. Data will show on your profile and the sponsors will know if you are a good fit for them. It’s transparent, clear and easy to use. The advertiser can contact you through the “Get Sponsored” button on your profile or you can check out the Opportunities section to view the latest offers. First of all, it’s reliable, very professional and signing up is for free. Their database already includes many influential, professional bloggers like Paul Johnstons from A Luxury Travel blog and Miki Kosman of The Barefoot Nomad, just to name a few. Another important factor is that we share the same philosophy on the relationship between advertisers and bloggers: it’s a pleasure to work with advertisers that understand the potential influence that bloggers have nowadays. I like sponsors willing to invest money in our hard work rather than our PR. 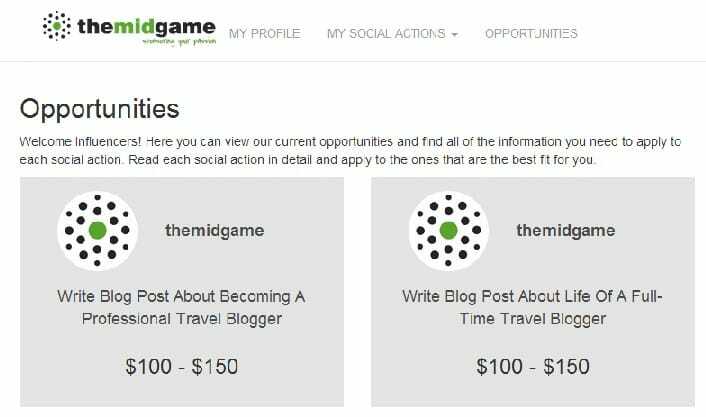 Signing up to a website like The midgame is one of the steps to take your blog seriously and start making money without worrying about the next Google update. I was lucky to work with them and liked the way they handled the whole process: you can negotiate prices directly with the sponsor and they are always open to suggestions. Everything is very clear and runs smoothly. They also have a Blog section with useful tips on how to deal with the sponsors plus a helpful FAQ section. Another good place to look for sponsored opportunities is this website called Blogness. The concept is basically the same as the other marketplaces: It connects you to valuable advertisers. Just make sure to only accept the requests that fit your brand/values. I find this to be the single most important thing to do in order to be successful and don’t lose your credibility for a few bucks now. Sometimes they offer me good money to advertise or mention products that have nothing to do with me or with travel and even if the idea of earning 200, sometimes 400$ is tempting don’t fall for it. One time I was offered more than 3000$ for a product and I had to decline… no jokes! I said no as I couldn’t see myself promoting something I didn’t find exciting or at least useful for my readers. The product itself wasn’t bad at all. But a good partnership with an advertiser is when you believe in the service/product and you’d try it yourself even without being paid. So my advice here is: By all means, sign up to these marketplaces but on your profile make sure to clarify what your website is about so that they will send you only relevant sponsors. A win-win situation for everyone! HOW MUCH CAN YOU MAKE WITH SPONSORED POSTS? If you write at least twice per week, you can squeeze in a sponsored post more easily. It is obviously not ideal to only write sponsored posts, so the more you write, the better you can make them work for your website. Make sure to publish only content with added value for your readers: sponsored or not it shouldn’t make any difference to them. After all, with the affiliates, I’m suggesting a product or service that I would use myself. Sponsored posts take a different approach, but the concept is exactly the same. It mainly depends on your influence. The more your audience is engaged, the more you can charge (from $50 to $500 or more). I love this monetizing model as it helps me diversify my income. Relying just on affiliate marketing is a risk and it’s best to always implement different ways of making money to be on the safe side. Besides the conventional, direct ways to make money online, you can also have an income by using your website as a portfolio of your work to get some free-lance assignments.There are various ways to be a freelancer with your travel blog. Paid consulting for people who needed to plan a trip to Sardinia. These are all good ways to use your blog to earn money in an indirect way. If you know a second language or have specialized skills, you should put them in your media kit and try to find people interested. It’s easier than you think. Always bring a few business cards with you, even if you are going to a beach party. You never know who you are going to meet. I got a few assignments during random social events. Handing out your business card is a sign of professionalism that gives you more chances to be considered. I scored my first paid photoshoot when I saw a flyer attached to a hostel door saying “Searching for Professional Photographer”. Well, I am not a professional, but I asked to talk to the manager, handed over my business card and showed her my blog. She liked it and decided to hire me, as I was less expensive than a professional. It was a win-win situation. Very important. So important that I wrote an article/guide after attending the WTM (World Travel Market) in London last year. You can find many useful tips in it, so check it out! This is the most important advice I can give you. You are probably thinking “Ok, but how exactly”? I know a blogger who partnered with a local travel agency and she now promotes the destination in exchange for a % on the sales. There are bloggers who organize tailored trips, cooperate together on consulting websites or create their own products/services. The possibilities are limited only by your imagination. Get creative, be patient and work hard. Trust me, the results will arrive sooner than you think! Of course, there are ways to speed up the learning process as the web has plenty of very useful resources on how to open a blog and take it to the next level, you can check a truly great guide on the topic in here! Have you found other original ways to monetize your blog? Do you want to add your own experience or ask about something I didn’t cover? Leave a comment! Disclosure: This post was sponsored by The midgame. All opinions are my own. wow thats great tips how to make money . but if you have great fb page and groups get more visit and make more money . When you think to make money from blogging., You should make a niche relevant blog site. You need to choose faster web hosting for your website. Because traffic prefer to visit a site again and again , if the site is faster and informative .Also fast loading site impact on SEO. Can’t register at marketplaces you wrote about. First says “php error”, second – something the same. Do they actual today or You can suggest something else? And maybe you will create post about guest’s posts exchange in future? What a brilliant article, I wish more people would write blogs like this that are actually helpful to read. Thank you so much for posting such a very informative post. Thanks for such an informative article. It look I need to work hard seems not easy. Your monetization tips are really good. Many thanks for sharing this, this will surely help me on monetizing my new travel blog. I am very thankful to you for sharing this informative article with us. thanks. Much obliged to you again for all the information you distribute, Good post. I was extremely keen on the article, it’s entirely motivating I ought to concede. I like going to you site since I generally go over fascinating articles like this one. Very inspirational and motivating article for newbie and established bloggers out there. I’m a travel blogger relatively very new 2months into this..take a peek at my blog http://www.traveltounwind.com and leave your valuable suggestions and feedback. Loved your affiliate marketing programs and other ways of monetizing (CJ,themidgame etc)..Thanks for being authentic and clear Clelia..way to go. Sto pensando di aprire anch’io un blog sui viaggi e dopo aver letto questo articolo vorrei farti una domanda che riguarda l’aspetto fiscale/legale. Come ti comporti per quanto riguarda la tassazione di questi guadagni? Hai la partita iva o cosa? Ho provato a cercare informazioni al riguardo, ma le opinioni sono molto contrastanti e decisamente non chiare. Grazie in anticipo se vorrai rispondermi e aiutarmi a capirci qualcosa in più. Loved your post with such details. I have been working on some of them that you have mentioned, and I got some more things to try from your post! Thanks for sharing! Thanks for the great article. I had a few bad experiences with affiliate programs that weren’t really relevant to my niche so I didn’t view them as worth while. But after reading this I am definitely going to take another look. Also, it’s amazing you have replied to all of the comments. I used to be so good at that, then my comment plugin started playing up and I just couldn’t be bothered to fix it. Hey there! I hope I am not too late to reply to your article. Thank you so much for sharing all these tips, totally awesome! I have learned several excellent stuff here. Certainly worth bookmarking for revisiting. Much of marketing is building a relationship between the brand name and also the customer. most likely I will add a blog to it too, and your summary is a treasure on the www, so thanks a lot! I’m late to reading your article Clelia and wonder how you are faring some years after writing it with affiliates? Thanks for the info on TheMidGame. I was not familiar with them, but will definitely be looking into them for a couple of the blogs I own. There are some other nice tips too. Really helpful. Thanks! I like your 2nd strategy the most. You are the wonderful travel blogger. How To Monetize a Travel Blog: 3 Easy Strategies That Really Work! Wow, this became very complete and well concept out, high-quality activity. i exploit my web page on the whole as a portfolio, but now that my numbers are manageable, I’m beginning to observe exceptional revenue streams, thank you for explaining the affiliate component, wasn’t equipped to make a number of study on this but the legitimate backed post and branding campaigns are what I’m starting to awareness on in the mean time. honestly enjoyed your thorough put up. Is there a problem earning money from a company that is not from your country of origin? I’m an American living in Thailand, and would like to use the 12Go Affiliate Program, which facilitates train, ferry, and bus ticket purchasing in SE Asia and is based in Bangkok. I’m wondering if that causes a problem at tax time, for example, or any other issue related to an American earning money from a Thai company. Nice article! Thanks for sharing so many great tips on monetizing a travel blog. We just launched a tool that enables bloggers to turn website traffic into new pay per minute consulting clients simply adding a line of code/Wordpress widget to their site. Check your inbox, just sent you over an interesting proposal! Ciao Clelia, this article is amazing! People usually don’t share this information and they keep all the secrets for themselves. 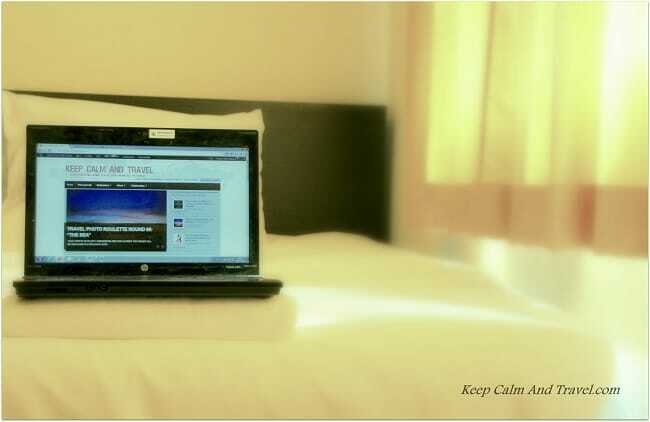 It is the first article I read concerning a travel blog. I really appreciate your suggestions and I will follow some of your points for my next project. Alright, after three months of studying how to set up a blog I bought both domain with siteground and X theme, which seems to be the best out there. Thanks for introducing me to it, its versatility will be useful to find the best layout at the beginning. I’m just starting to play with it! Great article, I saved it and I think in few months I’ll read it again. Thanks Clelia!